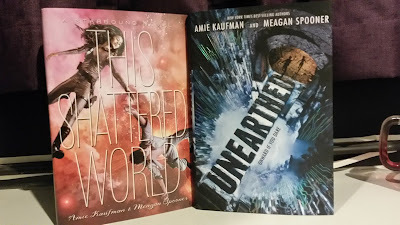 So last week, I attended Amie Kaufman and Meagan Spooner’s NYC event at Books of Wonder for their newly released title Unearthed. Unearthed is apparently a YA Indiana Jones book set in space. Sounds good, right? The giant Unearthed poster (left) and table all set up for the event. Amie Kaufman and Meagan Spooner are hilarious. They are completely lovely geeks, and I’m totally here for it. They talked about Star Trek, video games, Indiana Jones (of course), and even soundtrack composers. Both of them have such a fun connection to each other. You could tell that they were friends and that this wasn’t a simple case of two writers being forced to work together. They genuinely love what they do together. Speaking of what they do together, they mentioned how, in order to write their books, they actually have a team of people behind the scenes. For instance, they have a doctor friend who helped them figure out what kind of painful hand injury they could give their main character that would allow her to still perform dangerous tasks with only seconds to live. 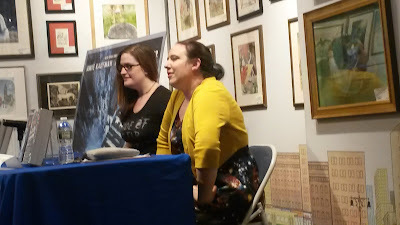 Amie also talked about how she was originally scared to have Meagan and Jay Kristoff (her coauthor for the Illuminae books) meet for the first time, just because she wanted them to get along. But apparently, after drinking and singing karaoke together, Meagan and Jay really hit it off. Amie had nothing to worry about. She said that they were basically like the same person because they liked the same things. As for the signing portion of the event, there was a lot happening there. I got to the event a little later than I’d planned (stupid subway was slower than dirt), so I was number 22 in the signing line. 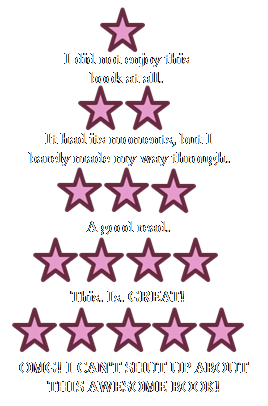 But, thankfully, I still had time to purchase a copy of This Shattered World, which was the plan all along. That was the plan. To pick up This Shattered World. 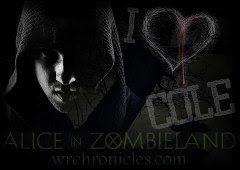 And no other book. Alas, I ended up buying Unearthed too, and Traitor to the Throne, but that’s just because I’d finished Rebel of the Sands earlier that weekend. 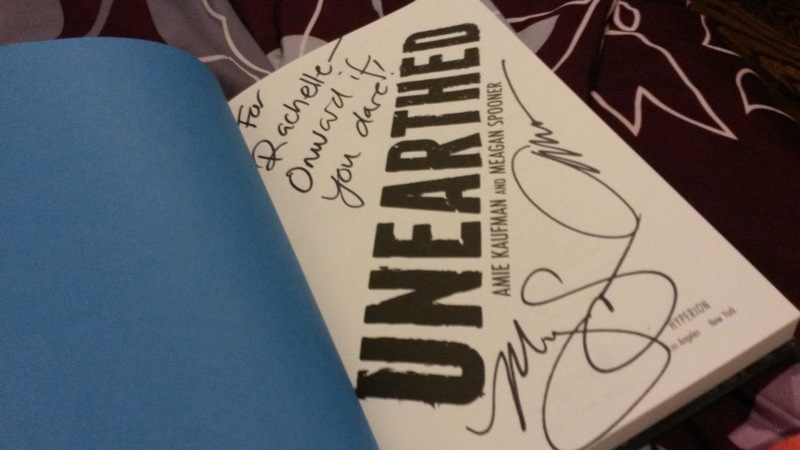 With the purchase of Unearthed, I also got a free tote bag! Yay for free stuff! 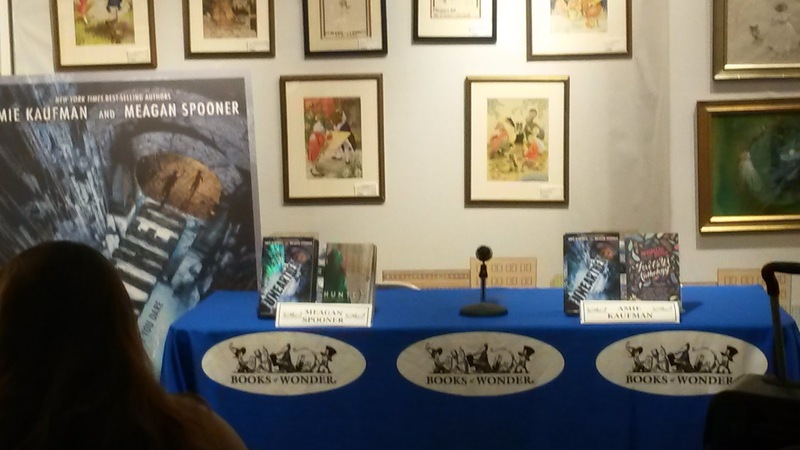 Once the signing portion started, I browsed the shelves of Books of Wonder while numbers 1-20 went through the line. When I finally reached Amie and Meagan, I said something super awkward. Because it’s me, and I’ve just grown to accept the fact that I will never not say something awkward at an author event. Anyway, I was talking to Amie Kaufman, and she apologized for the line taking a long time. I said something like “Oh, no problem. I’ve waited hours before for an event.” Then, I realized how rude that could potentially sound, as in, “Oh, don’t worry, your event didn’t attract as many people as these other authors I’ve seen.” Which isn’t true at all, there were actually a lot of people at the event. 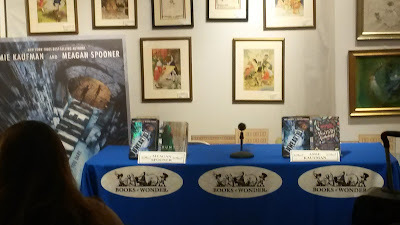 So, to make up for what could potentially sound like a mean, catty statement, I said something along the lines of “I had to wait hours for Tamora Pierce’s event. This entire building was full of people.” *sigh* My big mouth just doesn’t know when to stop. I think Amie understood what I meant though, because she was like, “Yeah, it’s Tamora Pierce” in almost a fangirl-esque kind of way… I hope. I didn’t really get to talk to Meagan for very long. 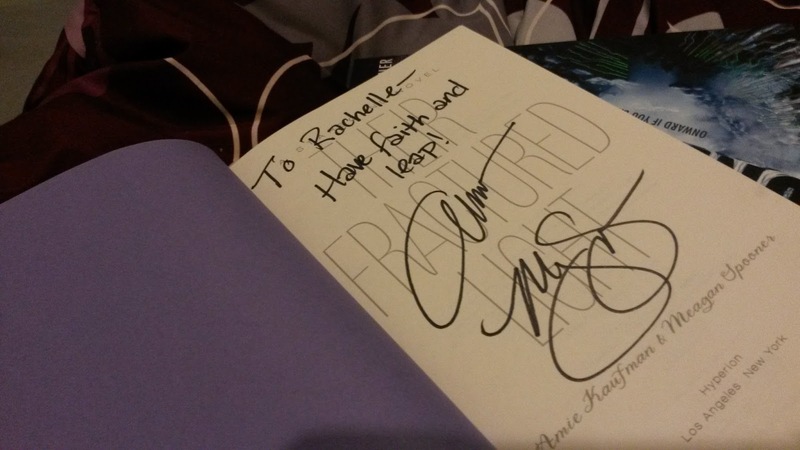 She just kind of signed my books, and I started the trek home, silently berating myself for my verbal diarrhea. Well, that was how that event went. I went, I saw, I bought books, I got the books signed, and I put my foot in my mouth. Let’s hope my next event has less embarrassing stories attached to it.